Set at 2050m, Pas de la Casa is the highest resort in the Pyrenees. 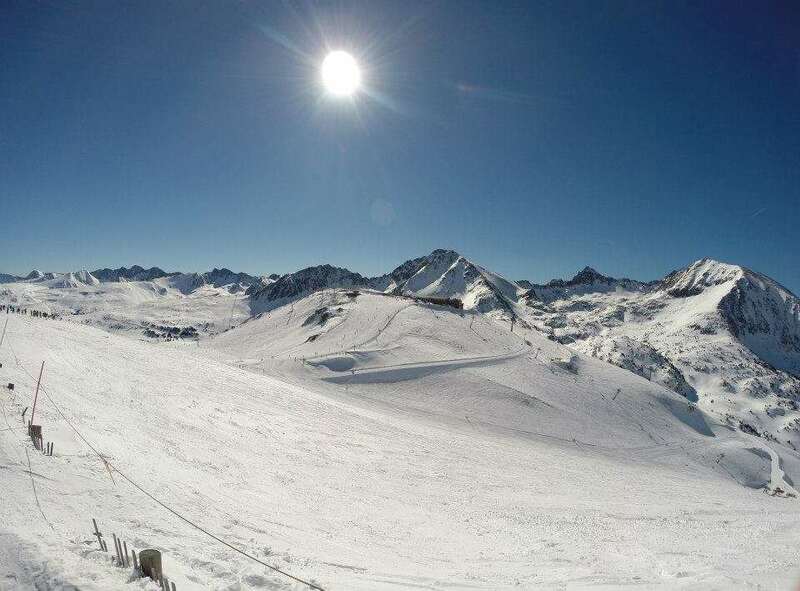 The height and excellent snow making capability ensure good snow conditions and a long season ensure the perfect conditions for ski holidays in Pas de la Casa. Pas de la Casa is part of the extensive Grandvalira ski area with links to Grau Roig, Soldeu, El Tarter, Canillo and Encamp. Pas de la Casa is found at the northern end of Andorra, it’s the border town with France and is the closest to Toulouse (transfer airport). Its proximity to France means that ski holidays in Pas de la Casa have more of a French atmosphere, than other Andorran resorts, however Pas de la Casa continues the tradition of great value for money. Pas de la Casa is a lively town with an extensive ski resort making it a favourable option for groups of skiers and snowboarders with mixed abilities. Due to the high altitude of the resort, it rarely closes before the end of April. There are 1013 snow cannons across Grandvalira that guarantees snow at more than 65% of the total ski area. The skiing on ski holidays in Pas de la Casa is probably the most comprehensive, especially when it is combined with Grau Roig and Soldeu. Ski holidays in Pas de la Casa offers something for all abilities, although intermediates and beginners are probably best catered for. Snowboarding is particularly popular and there is a board park and half pipe. Ski school as in neighbouring ski resorts, is dominated by English speaking instructors, so ski holidays in Pas de la Casa are excellent for beginners. With ideal locations and great prices, our fantastic range of Pas de la Casa hotels are perfect for any kind of ski holiday. Hotel Cal Ruiz offers half board catereing and is 600m for the ski lifts. Font D’Argent is a popular option in Pas de la Casa as it is next to the piste. From luxury spots to budget accommodation, our Pas de la Casa apartments will also tempt any skier with ease. Paradis Blanc Apartments are fantastic value for money and located next to the piste. Andorra is well known for its duty free shopping so you will find brilliant value within the shops in Pas de la Casa. We arrived in Pas on a Sunday afternoon, which is notorious for crowds from neighbouring countries to descend to take advantage of the low duty on luxury goods. The place was gridlocked until the early evening, when the mini bus was eventually able to deliver our luggage to our hotel. Pas is not a pretty place, but the excellent skiing more than compensates. It is a vast ski area with very well cared for pistes. There are lots of lovely mountain restaurants and miles of quiet runs. There were no lift queues to worry about. The town has a good range of restaurants and bars for apres ski, and drinks prices are not excessive, with many having happy hours. Shopping is well catered for, especially perfume, tobacco and alcohol. We would definitely return. This is an excellent resort, especially for the twenty-somethings. There is a good nightlife but a tad on the expensive side at 5 to 6 Euros a pint. The snow conditions were great in the morning, but a bit choppy in the afternoon and the ski school instructors are very patient. I would recommend hiring a ski locker if you stay near the bottom of the resort as carrying the ski equipment up the hill to the lifts is quite tiring. We stayed at Chez Paulo, the hotel food is second to none. We had a choice of three starters, three main courses and three desserts. One night we also had the option of choosing from the al la carte menu. Paulo and his staff are very accommodating, although the language barrier is a hoot to get over. All in all, a great resort to ski and have a great night out.